All Oktoberfest reservations are sold at original reservation/ voucher price which can range from 30€ to 85€ per person. Prices quoted on phone or email, displayed on website, and invoiced are for packages which includes original face value price per reservation, food and beer vouchers, booking fees, service for delivery, acquisition and logistics, translation services, Oktoberfest guide and help desk. All services are provided from the United States and package items are not sold separately. * Big Tent Package explained: Prices for specific large festival tent on a specific date and session can vary a lot. The ‘Big Tent Package’ was designed for the cost conscious traveler who doesn’t have a need for a specific tent during their visit. This flexibility on your part gives us the opportunity to book your reservation in one of the 14 big festival tents that represents the best tent, at the best value, for the date and time you select. We will notify you with the name of the tent, or present a few tent options, one to two weeks prior to your Munich date. 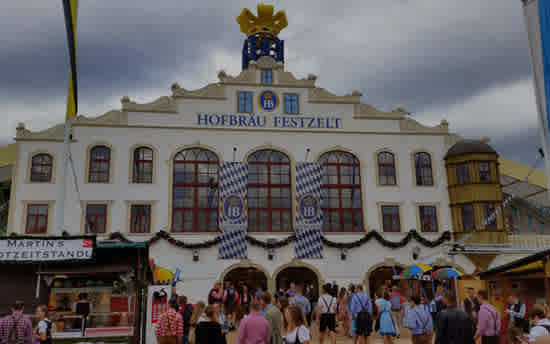 Oktoberfest is a folk festival in Munich, Germany which features music, carnival rides, food and beer in a 16 day long extravaganza which is fun for the whole family. The festival takes place in an area named Theresienwiese, which means field or meadow in German. This term is commonly shortened to wiesn, hence why you may see the festival referred to as the Wiesn. This meadow is located near the center of Munich and is covered with carnival rides, games, and stalls with traditional food which is a tribute to Bavarian culture. Each year there are over six million visitors to this festival in Munich. One of the aspects which attract the most attention is the Beer Tents – there are fourteen large tents and twenty small tents at Oktoberfest. Only beer meeting the standards for Bavarian Purity Requirements and brewed within the city limits of Munich can be served there with the only ingredients used in production of beer are water, barley, and hops. The Beer Tents are the heart and soul of Oktoberfest and it is there where true Bavarian cultures shines. Each tent has its own theme and each is more spectacular then the last. Anyone can gain admittance to the beer tents after waiting in line if it is not closed due to overcrowding; however, only those who have a fixed ticket reservation at a table where they are seated can order food or beer. The ticket reservation will be in the name of the owner of the table and a transcription to yours or your company name is not possible.You will be there as an official guest of the originally booked ticket reservation. A Veritable smorgasbord of food, beer and entertainment awaits you at Oktoberfest. The vendors sell traditional Bavarian food that would delight any one’s palate from sausage piled high with mustard and sauerkraut served with potato salad and honey dumplings for dessert to slowly roasted ox with steamed noodles. If you are simply in a snacking mood then indulge in a giant, soft, warm pretzel with dipping sauces, a Nutella crepe, waffles with whipped cream, or an apple strudel. If not interested in any of these fantastic options, then perhaps you would like potato pancakes or split-grilled chicken from the lovely ladies wearing dirndls. No matter what your preference you will find something you will love to eat at Oktoberfest. There is not enough space here to introduce you to each spectacular attraction of the Oktoberfest in detail. Shout as you fall with the "Power Tower 2!" 14 meters per second for 66 meters will certainly get your adrenaline running.Visible from afar, and especially in the evening, a wonderful lit eye-catcher is the Wiesn "Ferris wheel". Take is all in, just when you get to the Oktoberfest after sunset. The view is terrific! You may have heard of the "Olympic" roller coaster. Nearly 3,000 people enjoy the breathtaking ride which takes 5 loops per hour. I recommend you get something to eat after the ride. There are many classics at Oktoberfest like the flea circus. Yes, it's exactly what it sounds like -- trained fleas. Leave your dog at home. And perhaps the greatest fun at the Oktoberfest: The "Teufelsrad"! I won't ruin the surprise, but if you go in, you will have certainly a lot of fun! The Beer is called Oktoberfestbier. It is also known as Märzen or Märzen-Oktoberfestbier. Authentic Ocktoberfestbier is brewed only by the breweries within the city limits of limits of Munich and these are the only breweries allowed to participate in Oktoberfest in Munich. These beers origin lie in tradition. Through the years there was a strong brew which was brewed in the Spring called March beers, or Marzen. This Marzen was stored in ice- filled caves or cellars for summer consumption. These leftovers were finished off in the Fall to make room for the fresh harvest season to be placed in casks. 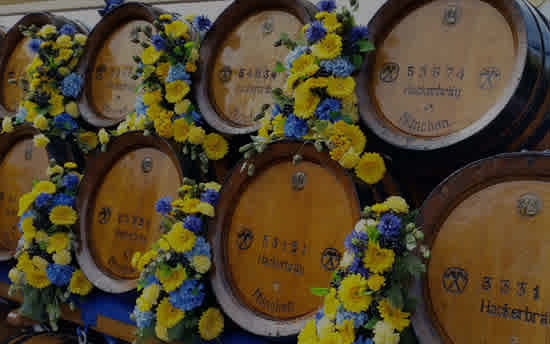 Oktoberfestbiers are always well-aged, exhibiting the traditionally deep amber color with the higher alcohol content of 5 to 6.2% that makes them a favorite of all. 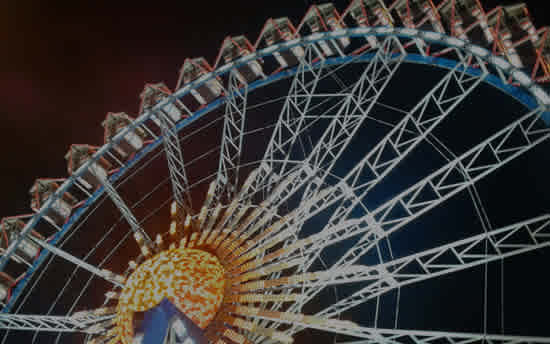 We understand that various groups have different needs for Oktoberfest, so we offer our clients a variety of options for making a ticket reservation. Click the reservation types below to learn more information. When you’re ready, choose a date to see our availability! With “Reserve a Session”, you choose a “lunch” or “evening” session on a certain date, and we’ll guarantee reserved seats at our choice of one of the big 14 beer tents based on availability. This reservation comes at a discounted rate. Choose a date! If you’re flexible with your Oktoberfest plans, check out our Flex Packages. We can get you one tent reservation into one of the 14 big tents during a specified date range. If you’re flexible on the date, we’ll work with you on the price! These reservations reflect current availability for specific tents on specific days. Choose a date! or if you don’t see what you’re looking for, Build a Custom Package! Would you like a package custom tailored to you or your group’s needs? We would love to accommodate you. Build a Custom Package! Oktoberfesttickets.com (“Site”), a wholly owned subsidiary of Empire Entertainment and Travel, Inc. (“us”, “we”, or “our”), is a private Atlanta-based corporation specializing in premium seats to high-profile sporting events, concerts, and theatre productions for national and international events around the world. Our company offers seats for a broad spectrum of events. We are not affiliated nor licensed by the Oktoberfest Festival, the Oktoberfest tent operators, or any box office or venue. The following Purchase Policies (“Terms” or “Agreement”) are presented to facilitate your understanding of and satisfaction with the purchase process with the Site. If you have any questions about the information below, please contact us at +1 (404) 846-8466. All Oktoberfest reservations are sold at original reservation/ voucher price which can range from 30€ to 85€ per person. Prices quoted on phone or email, displayed on website, and invoiced are for packages which includes original face value price per reservation, food and beer vouchers, booking fees, service for delivery, acquisition and logistics, translation services, Oktoberfest guide and help desk (the “Package”, “Reservation”, or “Tent Reservation”). All services are provided from the United States and package items are not sold separately. All orders placed on this Site are considered requests until you receive confirmation of the availability of the reservations and confirmation of your order. All sales are final; there are no cancellations, returns, exchanges or refunds. Confirmed package orders may be filled with comparable or upgraded tent reservations. Site reserve the right to fill your order up to 24 hours before the event. When you purchase a package, you receive our Buyer Protection Guarantee, as detailed below. All prices on the Site, or quoted via phone or email, are in US Dollars (USD). When you determine the package you wish to purchase, you fill out the information requested on the Site and submit the information, which acts as an offer to purchase the reservations. Once you submit the order, you cannot cancel or retract it. Upon the submission of the order, a hold will be placed on your credit or debit card for the funds necessary to purchase these tickets and you will receive an email promptly after you place your order. Neither of these actions complete the sale. A completed sale is dependent on the Site’s acceptance of the order and notice of confirmation to you that the order is accepted. Upon the Site’s acceptance of the order, your credit or debit card used in placing the order will be charged. The Site does not promise that it will be error-free or that it will provide specific results from use of the Site or any Content. The Site and its Content are delivered on an “as-is” and “as-available” basis. It is the purchaser’s responsibility to verify any possible inconsistency or discrepancy in the reservation location, description and/or price by calling the Site at +1 (404) 846-8466 before the order is placed. The Site reserves the right to reject an offer to purchase due to such errors and will not be liable for any damages of any kind arising from the use of this Site, including without limitation, direct, indirect, incidental, and punitive and consequential damages. At the Site’s sole discretion other off-line payment methods may be offered. Call the Site at +1 (404) 846-8466 before the order is placed to inquire about other methods we may offer. To protect you and the Site from fraud, you may be required to provide additional proof of identify on any order. Proof of identity may include but is not limited to a signed credit card authorization and/or photocopies of public documents such as a state driver’s license or federal passport. The Site reserves the right to replace tent reservations with comparable or upgraded reservations. When this occurs, we shall be considered to have fulfilled our obligations under these terms. Whether reservations are “comparable” or “upgraded” are made at the reasonable discretion of the Site. Should we fail to deliver any confirmed reservation package purchase, our sole obligation or liability shall be limited, unless otherwise required by law, to the return of any payment made by you for the undelivered package. We reserve the right to cancel and refund your order at any time for any reason and will not be liable for any damages of any kind, including without limitation, direct, indirect, incidental, and punitive and consequential damages. While every reasonable effort will be made to adhere to the advertised Package features, Site reserves the right to change or omit Package features, as it deems necessary, or as deemed necessary by the event organizers, without penalty and in such situations, no refunds, part refunds or alternative offers shall be made. The Site’s Buyer Protection Guarantee means that your transaction will be safe and secure, the package shall be delivered prior to the event, the tent reservations shall be identical, comparable, or better than the reservations you ordered, and the reservations shall be valid and authentic. Your only recourse under the Buyer Protection Guarantee is the return of any payment made for the package. In the rare instance of a downgrade, as determined at the Site’s sole discretion, you will be notified prior to seats being downgraded, you will be able to cancel your order and receive a refund. Other than return of any payment made for the Package, the Site will not be liable for any damages of any kind, including without limitation, direct, indirect, incidental, and punitive and consequential damages. All sales are final, so please only order a package after you are sure that you want them and can attend on the date and time of the package tent reservation. You cannot cancel your order if your plans change, the date or time of the event changes, you find different reservations that you prefer, or your ability to attend an event changes, nor can you substitute or exchange your reservations if you order incorrectly. A full refund of the purchase price will be given for cancelled events. The Site, in its sole discretion, will determine when an event is cancelled. To qualify for a refund, you must return your tent reservation documents and food vouchers as soon as possible, but in all cases, within ten (10) business days after you are offered a refund. No refunds will be given without the original reservation documents and food vouchers, unless otherwise determined by the Site in its sole discretion. Postponed or rescheduled events will not be refunded, and your tent reservations will be valid for the later date. If your travel itinerary doesn’t allow for the later date then the Site, in its sole discretion, will make every attempt to re-sell your postponed or rescheduled tent reservations at the current fair market value, which may be more or less than your purchase price and, if sold, refund the difference less 20%. The Site reserves the right to cancel any Package or extension in this program, in which case all monies received by the Site from you shall be refunded in full within 30 days. The Site’s liability is limited to refunds of payments received. Event date, times, venue, tents and subject matter may change. We shall not be held responsible for any such change and will not be obligated to provide a refund or any other compensation in the event such a change occurs. In certain instances, a tent, or any entity putting on the event will require a reservation holder to relocate his or her seat or otherwise change the table or seating configuration. You acknowledge that these changes are outside the Site’s control and we are not responsible. If you are experiencing difficulty getting into a tent using the reservation documents you purchased from the Site, and denial is strictly due to invalid reservation documentation, contact us immediately for assistance at the phone number provided to you in your Package. The Site’s Munich contact will make every effort to resolve the problem or provide replacement reservations in the same, or another equal or better tent, as determined by the Site. If the Site’s Munich contact are unable to provide one of the above resolutions, and in our sole discretion that the ticket was invalid, then your sole remedy will be to receive a full refund as outlined under the Buyer Protection Guarantee. You are required to be at the tent’s reservation entrance 15 minutes prior to your reservation time and seated at your table at the designated reservation time. The tents do not honor any reservations where the you do not take your seats on time! No Exceptions. If denial is due to not being on time, you have violated the Behavior Policy in any way, or you do not contact the Site’s Munich contact for assistance, the Site is not liable to provide any refund under the Buyer Protection Guarantee. The Site will make every effort to fill your Package order as soon as possible. However, because each tent and or reservation holder has varying release policies, the Site reserve the right to fill your order up to 24 hours before the event. Packages will either be shipped to you, delivered to your Munich hotel, or you will meet a Site representative in Munich (“Meet & Greet”). A delivery fee will be assessed in the Site shopping cart checkout that will cover delivery except where noted below. After you place your Package order a Site representative will contact you with delivery expectations and to collect additional information from you, such as but not limited to your Munich arrival date, your Munich mobile phone number, and the name and address of your Munich Hotel. Courier Delivery. If your Package is available via domestic shipment to your US credit card billing address prior to your departure to Germany we will ship via a major courier, such as FedEx or UPS, at no additional cost. An adult signature will be required to accept delivery. We will notify you once your order has shipped and you will be provided the tracking number. You will be responsible for coordinating delivery with the courier if you are unable to be available during their delivery estimated time. International shipments will incur additional charges. You have the option to select delivery to your Munich hotel or Munich meet and greet at no additional cost to you. Munich Hotel Delivery. If your Package can only be shipped from Munich, or time doesn’t allow for Courier delivery, a Site representative, or third party contracted by the Site, will deliver your Package to your Munich city-central Hotel front desk. The Site, in its sole discretion, will determine whether your hotel is located within our Munich city-central delivery zone. If your hotel is located outside our Munich city-central delivery zone, and the Site determines we can deliver to that hotel, there will be an additional charge. To avoid an additional charge you have the option to arrange a Meet & Greet with the Site representative. It is your responsibility to communicate the correct hotel name, address, the name the reservation is registered under, check-in date, and to advise your Site representative of any changes. It is also your responsibility to advise the hotel that you will be receiving a package and to communicate any additional information given to you by the hotel to the Site representative required to make your delivery. You should advise the hotel the package may be delivered prior to your check-in date, and that the delivery will require a signature of acceptance by an authorized hotel staff member. Meet & Greet Delivery. Meet & Greet delivery can be arranged with the Site representative for any order not available more than 24 hours before your Reservation date and time, where Courier delivery is impractical, Munich Hotel delivery is not possible, or at the Site’s sole discretion. 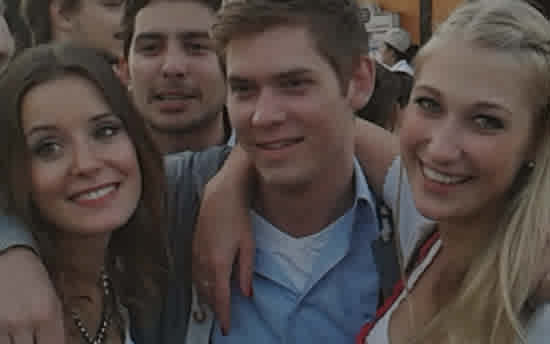 The Site representative will arrange a time and location where you will meet our Munich contact. This is often Munich city-central close to the fairgrounds and will be at a time prior to your reservation time with enough time allowed to arrive at your tent on time. The Site representative will require your Munich mobile number and you will be given the Munich contact mobile number. You are responsible for contacting the Munich contact member if you are running late or are having problems finding the Meet & Greet location. You waive any recourse from Site’s Buyer Protection Guarantee if you do not arrive at the Meet & Greet location at the designated time. You acknowledge that tent reservation documents and food vouchers are NOT replaceable and should be treated that same as cash. The Site is not responsible for lost, stolen, damaged or destroyed reservation documents and food vouchers and are under no obligation to replace them. You are responsible for ensuring that your tent reservation documents and food vouchers are kept in a safe location. You agree to abide by all rules and policies of the Site, fairgrounds, tent and anyone else responsible for putting on the event. Should you fail to abide by those rules and policies, you shall be subject to all applicable fines and legal or other expenses associated therewith. The site will not be liable in any way for any failure by you to abide by all rules and policy. Tent staff and security are not tolerant with rule violations or rude behavior and at a minimum you may be asked to leave the tent immediately. Further, you acknowledge you will be a guest of the original reservation holder, who may or may not be present during your seating. Should any violation result in the loss of future table reservation rights of the reservation holder you shall be held liable for all reasonable costs, expenses and losses associated with said loss including, but not limited to, all direct, indirect, vicarious, consequential, exemplary, incidental, special or punitive damages, including lost profits. The Site Package makes an attempt to outline all the rules and policies that you are required to know, although you acknowledge it may not be all inclusive. It is your responsibility to read and follow all direction set out in the Package, and to follow and abide by any verbal directives that may be given to you by the Site representative, Munich contact, tent staff and security, police or any other authority. Unless specifically stated in the Package, it is your responsibility to secure, pay for and coordinate all travel and hotel reservations. Your Package does not include any local transportation, meals, tours, or any other activity or expense not specifically stated in Package. It is your responsibility to obtain the documentation required for their trip such as but not limited to visas, birth certificates, and photo identification. A valid passport is required for all travelers. It should be valid six months after the return to the U.S. It is your responsibility to have proper documents before entering the European Union. Travelers are required to show a passport for entry. The Site is not responsible for but not limited to delayed or missed flights, loss, overbooking, change of hotel reservation, or any other situation that may make you unavailable to attend your tent reservation in your Package and you will not be entitled to a refund. The Site not responsible or liable for defaults of those not directly under the control of the Site. The Site is not responsible or liable for loss, damage, theft of luggage and/or personal belongings, or for personal injury, accidents and/or illness. For your protection, it is important that you have, or purchase insurance to cover these possibilities. To the extent permitted by the law, you release the Site (including their directors, officers, employees, consultants, contractors, agents and volunteers) from any liability for any damage, loss, liability or injury you may suffer in relation to your travel or participation in the event. You accept responsibility for your own actions. You acknowledge that you are responsible for your own safety and for the safety of any children accompanying you. You understand that foreign countries may be unfamiliar to you, so we encourage you to be careful always. You agree to compensate the Site for any damage, loss, liability or injury the Site or anyone else may suffer because of your willful, reckless or negligent acts or omissions. The Site reserve the right to accept or reject any person who has purchased a Package and to expel anyone whose conduct is deemed inappropriate. We will also retain Usage Data for internal analysis purposes. Usage Data is generally retained for a shorter period of time, except when this data is used to strengthen the security or to improve the functionality of our Site, or we are legally obligated to retain this data for longer time periods. To protect and defend the rights or property of Empire Entertainment and Travel, Inc.
You have the right to data portability for the information you provide to Empire Entertainment and Travel, Inc. You can request to obtain a copy of your Personal Data in a commonly used electronic format so that you can manage and move it. These third parties, not limited to those listed, have access to your Personal Data only to perform tasks on our behalf and are obligated not to disclose or use it for any other purpose. If we transfer personal information to third party providers, this will be solely on the basis of an agreement limiting use by the third party provider of such personal information to processing necessary to fulfil their contract with us and obligating the third party provider to take security measures with regard to such data. We do not sell, rent, or otherwise disclose your personal information to third parties for their marketing and advertising purposes without your consent. You are responsible for any and all legal fees incurred by you or Site associated with your disputed charges and chargebacks for purchases made, or tickets listed, on this Site. You on the one hand and the Site on the other hand, each agree that any and all disputes, controversies, or claims arising out of or relating to: (i) these Terms; (ii) your use of, or access to, this Site; (iii) Site’s services; or (iv) any tickets or other items sold or purchased through this Site shall be resolved exclusively through final and binding arbitration in Atlanta, Georgia, rather than in court. SPECIFICALLY, YOU HEREBY AGREE TO WAIVE ALL RIGHTS AND CLAIMS TO A TRIAL BY JURY. The Federal Arbitration Act governs the interpretation and enforcement of this agreement to arbitrate. Customer satisfaction is our number one goal. To that end, Site is committed to resolving disputes with its customers in a fair and efficient manner. Prior to commencing any arbitration related to this Agreement, you agree that if you have a dispute with Site, you must first contact our Customer Service Department at +1-404-846-8466. If our Customer Service Department is unable to achieve a satisfactory resolution, then you must notify us in writing about your claim by sending the accompanying form by certified mail to: Empire Entertainment and Travel, Inc., 3 W Paces Ferry Rd NW, STE 203, Atlanta, GA 30319. It is important that you provide as much information as possible. Our representative will respond within thirty (60) days of receiving this notice. If the matter is not resolved to your satisfaction, then you agree to begin arbitration by submitting a Demand for Arbitration to the American Arbitration Association (“AAA”). You further agree that exclusive jurisdiction for any such arbitration shall be Atlanta, Georgia. The Demand for Arbitration and the AAA’s rules are available at www.adr.org. The arbitrator, and not any federal, state, or local court or agency, shall have exclusive authority to resolve any dispute arising out of or relating to the interpretation, applicability, enforceability or formation of this Agreement, including, but not limited to, any claim that all or any part of this Agreement to arbitrate or the Terms is void or voidable. The arbitrator will decide the substance of all claims in accordance with the laws of the state of Georgia. The arbitrator’s award will be final and binding, and judgment on the award rendered by the arbitrator may be entered in a court having jurisdiction thereof. You can choose to reject this agreement to arbitrate. If you do not wish to be bound by this agreement to arbitrate, you must notify us in writing within thirty (30) days of the date that you first access this site. Your written notification must include your name and address, as well as a clear statement that you do not wish to resolve disputes with Site through arbitration. Written notification should be mailed by certified mail to: Entertainment and Travel, Inc., 3 W Paces Ferry Rd NW, STE 203, Atlanta, GA 30319. YOU ON THE ONE HAND AND SITE ON THE OTHER HAND AGREE THAT EACH MAY ONLY BRING CLAIMS AGAINST THE OTHER ON AN INDIVIDUAL BASIS AND NOT AS A PLAINTIFF OR CLASS MEMBER IN ANY PURPORTED CLASS OR REPRESENTATIVE ACTION OR PROCEEDING UNLESS BOTH YOU AND SITE ACKNOWLEDGE AND AGREE THAT THE WAIVER IS MATERIAL AND ESSENTIAL TO THE ARBITRATION OF ANY DISPUTES BETWEEN THE PARTIES AND IS NON-SEVERABLE FROM THE AGREEMENT TO ARBITRATE CLAIMS. IF THE WAIVER IS LIMITED, VOIDED OR FOUND UNENFORCEABLE, THEN THE PARTIES’ AGREEMENT TO ARBITRATE SHALL BE NULL AND VOID WITH RESPECT TO SUCH PROCEEDING, SUBJECT TO THE RIGHT TO APPEAL THE LIMITATION OR INVALIDATION OF THE WAIVER. UNLESS YOU AND SITE AGREE OTHERWISE, THE ARBITRATOR MAY NOT CONSOLIDATE OR JOIN MORE THAN ONE PERSON’S OR PARTY’S CLAIMS, AND MAY NOT OTHERWISE PRESIDE OVER ANY FORM OF A CONSOLIDATED, REPRESENTATIVE, OR CLASS PROCEEDING. ALSO, THE ARBITRATOR MAY AWARD RELIEF (INCLUDING MONETARY, INJUNCTIVE, AND DECLARATORY RELIEF) ONLY IN FAVOR OF THE INDIVIDUAL PARTY SEEKING RELIEF AND ONLY TO THE EXTENT NECESSARY TO PROVIDE RELIEF NECESSITATED BY THAT PARTY’S INDIVIDUAL CLAIMS. ANY RELIEF AWARDED CANNOT AFFECT OTHER SITE USERS. Empire Entertainment and Travel, Inc.